[Click for more information]CI and CII stakeholders. Between 2006 and 2010, 13 issues of the ECN have been published, partly supported by the EU projects CI2RCO and IRRIIS. 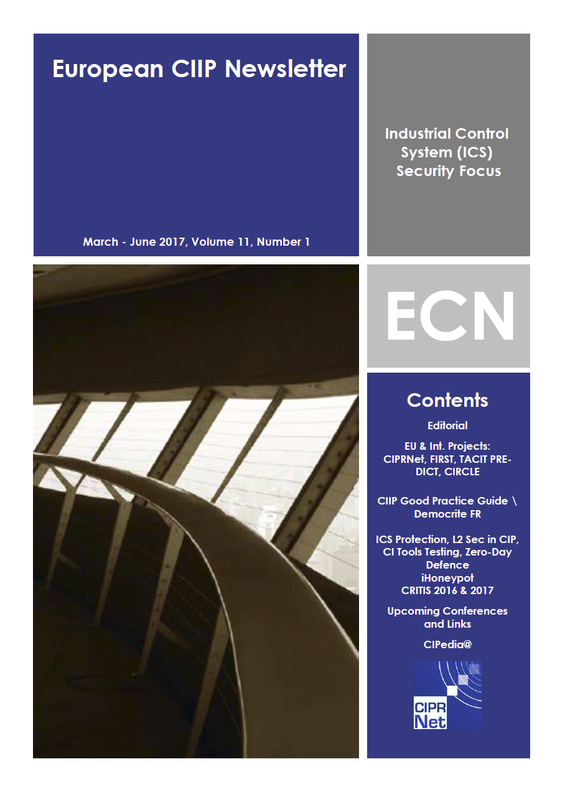 CIPRNet continues to support the publication of the ECN until 2017. [Click for more information]CI operators, crisis managers and civil protection agencies. Our target audiences are kindly invited to submit articles for publications in the ECN. Please download the current ECN template here. If possible, please include a photo of the corresponding and/or main author. For any other images included in the article, please ensure that you have the permission to use those images. Please send your article to the editor in chief or to the co-editor of the targeted ECN issue. Towards a European Infrastructure See computer simulation. [Click for more information]Threat See computer simulation. EU-CIRCLE: A pan-European framework for strengthening The European Council Directive 2008/114/EC defines: ‘Critical infrastructure’ (CI) means an asset, system or part thereof located in Member States which is essential for the maintenance of vital societal functions, health, safety, security, economic..
Until 2017, 12 new issues are published; 3 per year.